One of the easiest ways to add sensory play to your child’s day is through sensory bins. They allow your child to explore through his senses in a contained area on a central theme. 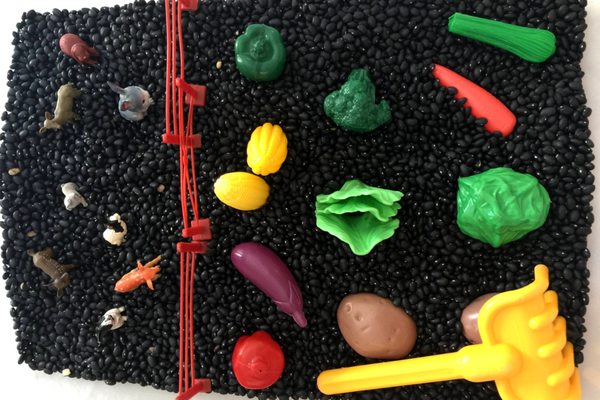 The following sensory bins are perfect for toddlers! Note: Know your toddlers when using sensory bins- especially if they are still in an oral stage and put objects in their mouths. Color themed sensory bins are the perfect way for toddlers to learn their color! 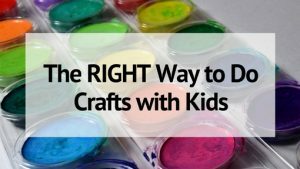 They engage the senses and allow your child to explore a single color at a time- which helps them commit that color to memory! 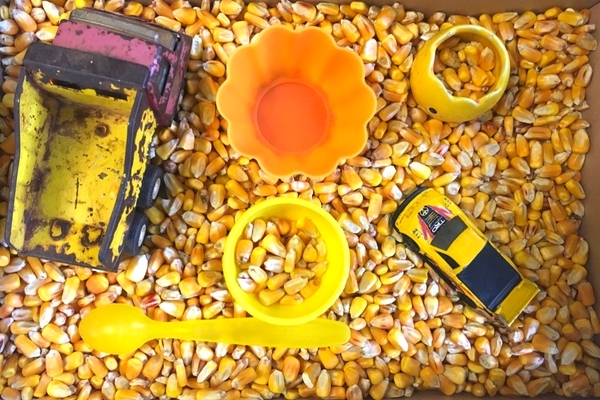 Here are directions on how to create a Yellow Sensory Bin. These directions can be applied to any color. Similar to color-themed bins, shape themed sensory bins allow toddlers to experience one specific shape at a time. They can explore how they look and feel- their edges, corners, etc. Get directions for a Square Sensory Bin for ideas on how to make a shape themed bin for your toddler. Water beads are so much fun for toddlers to play with. And they can be used in so many ways and in a lot of different learning activities. Your toddler will love the feel of the smooth, wet beads. 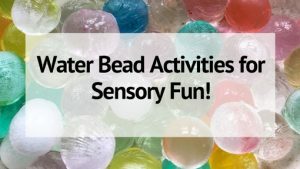 Here’s how to get started with Water Bead Sensory Play with your toddler. Toddlers are known to get worked up every now and again. 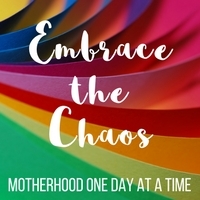 And they often need time to calm down and decompress. That’s where this calming herbal sensory bin comes in! 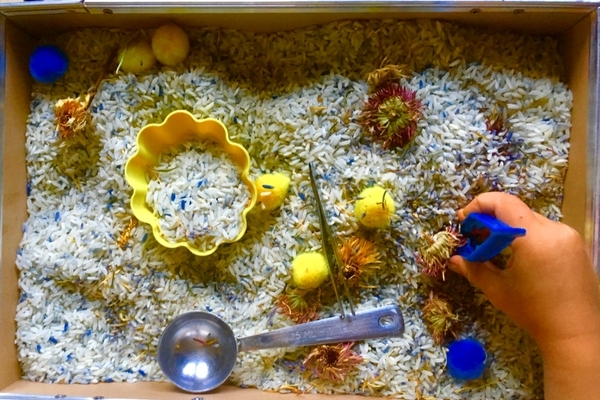 This sensory bin uses calming lavender and herbs to engage your toddlers sense of smell and calm they down as they play with the soothing rice. Learn how to make this Calming Sensory Bin. 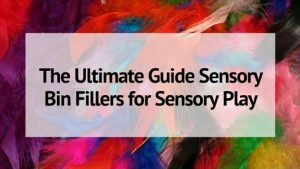 Relared Reading: 40+ Sensory Bin Fillers to Try in Your Next Activity! This sensory bin is all about good clean fun! And it’s totally frugal fun too! It’s like a bubble bath- without the bath. Perfect for toddlers to play with on a hot summer day out in the share, or on a rainy day in the kitchen sink. Here’s how to make towers of bubbles with this Soap and Water Sensory Bin! 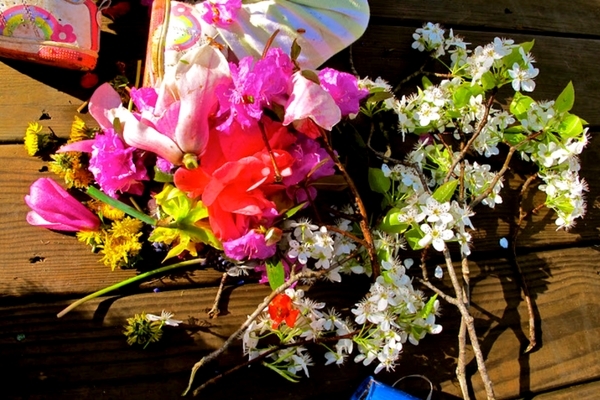 This flower sensory bin is a ton of fun for toddlers in the spring and summer. And it’s totally free too- you just need what you have in your own yard. Flowers offer lots of sensory stimulation with all of their different scents, feels, and colors. Learn more about how to set up this Flower Sensory Bin. I love sensory bins that feature beans- they feel great on the hands! Toddlers will love vegetable garden sensory bin- and it’s the perfect way to start teaching them about gardening and where their food comes from. Get directions on how to make your own Vegetable Garden Sensory Bin. My kids have always loved our fish tanks or visiting the pet store- and this Fish Tank Sensory Bin brings the aquarium home to play in! 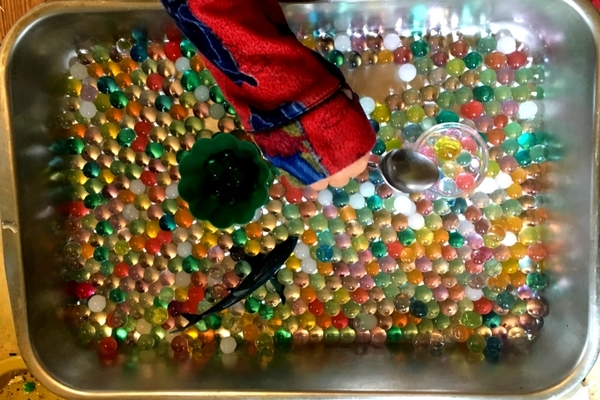 I love the colors of this sensory bin and the fact that it’s under water. 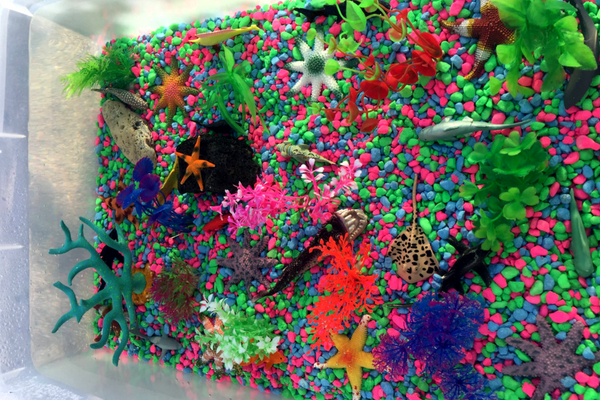 Get directions of how to make this Fish Tank Sensory Bin for your toddler! I’ve got 5 sons…and they all LOVE their trucks and construction vehicles. 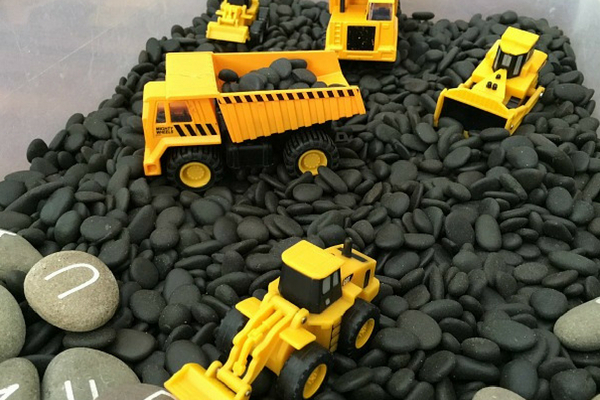 This construction sensory bin brings in smooth rocks and a little alphabet learning plus all those fun yellow and black construction trucks! 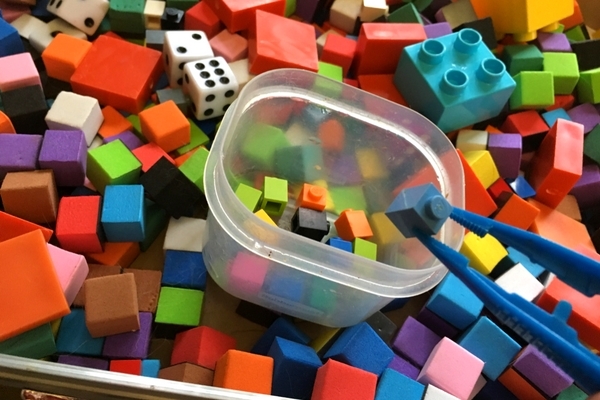 Learn how to make your own Construction Zone Sensory Bin. 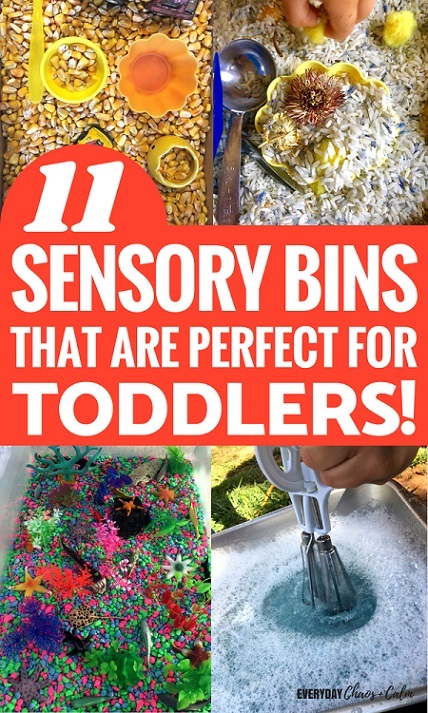 This is another fun and clean sensory bin for toddlers. The theme is simple- get the toys dirty and then scrub them clean. 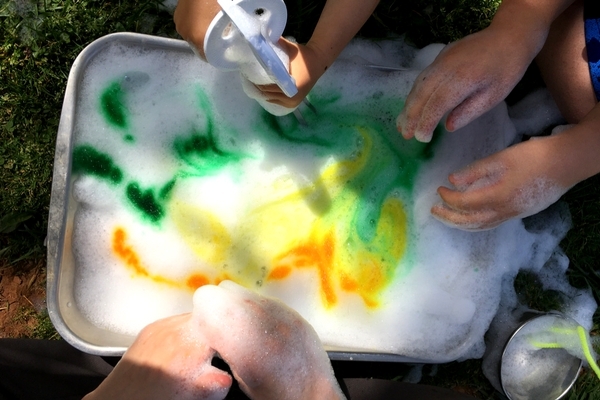 Seems like great practice for washing and cleaning up after yourself- and a great outside sensory activity for summer time! 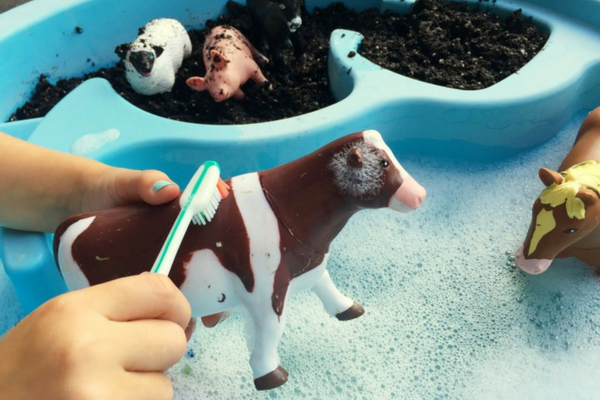 Here’s how to make the Farm Animal Washing Station. Sand boxes are the old standby when it comes to sensory play. It’s what all of use grew up playing in! 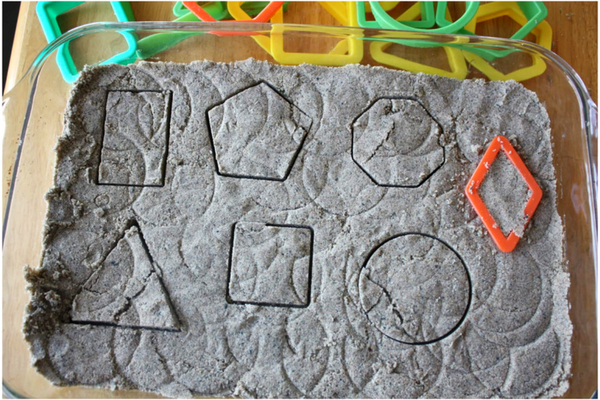 This sensory bin for toddlers adds a new level to playing in the sand by creating sand DOUGH! Now you always have wet sand! It’s like combining the best of playdough and sand into one! Learn how to make your own Sand Dough!